My photo for this week did not come out the way I wanted it and I am using a pic from the previous week. Anyway, with all the amazing graffiti it missed the cut but I just love all the texture and general grime. So it made the cut! This was a random laneway in South Melbourne. 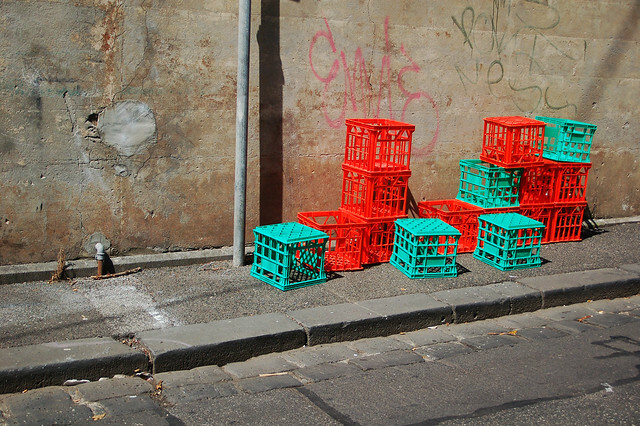 The crates provide the pop of colour needed to brighten up an otherwise drab backstreet. Check out my photos Side by Side with my buddy Ross at the side by side blog. Side By Side Week 127 - G'day Mate!